William E. Hoffmann, Jr. '67, J.D. '77 visited campus for two days this fall as both a Dunn Fellow and a Williamson Fellow. David Garland '80 recently returned to W&M Law School to share advice on how law students can take charge of their careers. U.S. Senator for Virginia Tim Kaine was keynote speaker at a Dec. 5 conference hosted by W&M Law School's Virginia Coastal Policy Clinic. The Student Intellectual Property Society welcomed alumnus Jeffrey Ambroziak J.D. '98 on November 21 as he presented a talk detailing his journey to becoming the cartographer and inventor he is today. Prof. Tillman J. Breckenridge recently gave the second lecture in the W&M Black Law Students Association L. Douglas Wilder Speaker Series. William & Mary Law School Professor Alan J. Meese has joined an amicus brief with 14 other antitrust scholars in O'Bannon v. NCAA. Students at William & Mary Law School set aside their studies on Friday, Nov. 21, to participate in the 14th annual Thanksgiving Basket Competition sponsored by the Black Law Students Association. The largest one-time gift in the school's history, made by graduate James A. Hixon J.D. '79, M.L.T. '80 was announced at the ceremony. The building will be named the James A. and Robin L. Hixon Center for Experiential Learning and Leadership. The Law School honors R. Harvey Chappell, Jr. with a reading room in the Wolf Law Library. Thanks to the staff of the Wolf Law Library, four hundred issues of the Law School's student newspapers--published over the past 45 years--can now be read online via the Scholarship Repository. William & Mary Law School formally dedicated the John E. Donaldson Classroom (Room 127) on Nov. 6 in honor of John E. Donaldson J.D. '63, the Ball Professor of Law Emeritus. Professors Paul Marcus and Adam Gershowitz discuss the impact of the Supreme Court's decision involving police search of cell phones and unanswered questions arising from it. The Law School has announced that its Domestic Violence Clinic is the recipient of a grant from the Department of Justice Office on Violence Against Women (DOJ OVW). The grant will provide more than $250,000 over two years to expand the services of the existing clinic. Property rights expert Michael M. Berger has been awarded the 2014 Brigham-Kanner Property Rights Prize. Students handle complex and time-consuming claims when they work for the Veterans Benefits Clinic, developing skills that have a huge impact on their future success. William & Mary Chancellor Professor of Law Ronald Rosenberg has been honored with an appointment to the Virginia State Bar Board of Governors for the Environmental Law Section. The Honorable Will A. Gunn, former General Counsel for the U.S. Department of Veterans Affairs, recently gave the inaugural lecture in the William & Mary Black Law Students Association L. Douglas Wilder Speaker Series. The William & Mary Property Rights Project announced the recent publication of the third volume of the Brigham-Kanner Property Rights Conference Journal. BLSA recently sponsored a screening of the award-winning film Fruitvale Station, followed by a panel discussion. James Sandman, President of the Legal Services Corporation, shared leadership advice with law students during the fourth annual McGlothlin Leadership Forum. 2nd Lt. Kaylee Gum '16 worked to enhance delivery of legal aid to the Iraqi people during her summer 2014 public service internship. The fourth annual McGlothlin Leadership Forum will be held Oct. 21-23 at the Raymond A. Mason School of Business and the William & Mary Law School. Leaders in law and business will engage in discussions with students and members of the community on Oct. 21-23 during the fourth annual forum. Allison Orr Larsen appeared Monday, Oct. 6 on Comedy Central's late-night talk show The Colbert Report starring Stephen Colbert. William & Mary Law Professor Allison Orr Larsen '99 will appear Monday, Oct. 6 on the late-night talk show The Colbert Report. William & Mary Law School announces the appointment of Aniela K. Szymanski as a visiting professor of practice and staff attorney of the Lewis B. Puller, Jr., Veterans Benefits Clinic. As their second week of classes came to a close, new students at William & Mary Law School were invited on September 4 to attend a private tour of Colonial Williamsburg and walk in the footsteps of many of America's founders. Professor McSweeney explores the text in articles in anniversary publications sponsored by the ABA and the Library of Congress.He also will help host an Institute of Bill of Rights Law conference on Magna Carta in spring 2016, the 800th anniversary of the text's reissue. During the day-long Lawyers as Leaders conference, alumnae from across the nation spoke to students and other alums about the role of lawyers as leaders. Prof. Helena Mock J.D. '00 received the 2014-15 St. George Tucker Adjunct Professor of Law Award at the Law School's annual kickoff luncheon. Kristin Poole, J.D. '16, was honored as one of TowneBank's 2014 Alvin P. Anderson Scholars. Professor Susan Grover is the recipient of the James R. Treese Award for her service to the legal community. W&M alumnus and former university Rector Henry C. Wolf ’64, J.D. ’66 and his wife, Dixie Davis Wolf, have given $3 million to establish the the Law School's 1779 Scholars Fund and to create The Wolf Gallery at the university’s Muscarelle Museum of Art. Starting this Saturday at 2 P.M. at the Kimball Theatre, William & Mary Law School's Once Upon a Crime is now open to the public for the first time. In an August 27 letter to Secretary of Veterans Affairs Robert McDonald, U.S. Senator Mark R. Warner of Virginia urged him to designate the Puller Veterans Clinic at William & Mary Law School as a Veterans Center for Excellence. William & Mary Law School accepted the ALS Ice Bucket Challenge and raised more than $1,000 for ALS research. The Law School's student lounge received a major upgrade this summer, and has reopened as Zime, "a bistro with a twist." Crystal Shin is the Visiting Professor of Practice and Managing Attorney of the Parents Engaged for Learning Equality (PELE) Special Education Advocacy Clinic. The Law School recently welcomed the J.D. Class of 2017, the LL.M. Class of 2015, and transfer and visiting students. Two new professors joined the faculty in July: Darian M. Ibrahim and Sarah R. Wasserman Rajec. Attorney Michael M. Berger of Manatt will be honored during the event. The scholarship competition is open to third-year law students at William & Mary and William & Mary law alumni who graduated within the last two years. William & Mary Law School's alumni and friends supported the School in record-breaking numbers during the fiscal year that ended June 30, 2014. W&M Takes Home Attorney General's Cup in "Legal Food Frenzy"
Roy A. Hoagland has been named a Visiting Professor of Practice and Director of William & Mary Law School's Virginia Coastal Policy Clinic. In the Supreme Court’s unanimous opinion on cell phone searches, Chief Justice John Roberts twice cited an amicus brief authored by W&M Law School Professor Adam M. Gershowitz. William & Mary Law Professors Alan Meese and Nathan B. Oman discuss a number of issues concerning the Hobby Lobby case. W&M faculty will be available to comment on U.S. Supreme Court opinions as they are made available. The W.M. Keck Environmental Field Lab and the Law School's Virginia Coastal Policy Clinic are among initiatives receiving funding. Timothy Zick, a member of the William & Mary Law School faculty and a highly regarded constitutional law scholar, has been named the Mills E. Godwin, Jr., Professor of Law. The award is named in honor of William & Mary President and former Law School Dean Taylor Reveley, and recognizes outstanding commitment to public service by an alumnus or alumna who has graduated in the previous 10 years. The Law School applauds the Senate Appropriations Committee's decision yesterday to direct the Department of Veterans Affairs to partner with law school clinics that help our nation's veterans navigate the complex VA benefits process. Qian (Lindsey) Ling, a member of the LL.M. Class of 2014, provided words of welcome at William & Mary Law School's Diploma Ceremony on May 11. The text of the welcoming remarks given by 2013-14 Student Bar Association President Sean J. Radomski '14. On Saturday, May 10, the Law School community gathered in Colonial Williamsburg's Kimball Theatre with soon-to-be-graduates, their families, and friends to celebrate the Class of 2014's contributions and achievements. Sean J. Radomski J.D. '14 received the award at the Law School's May 11 Diploma Ceremony. 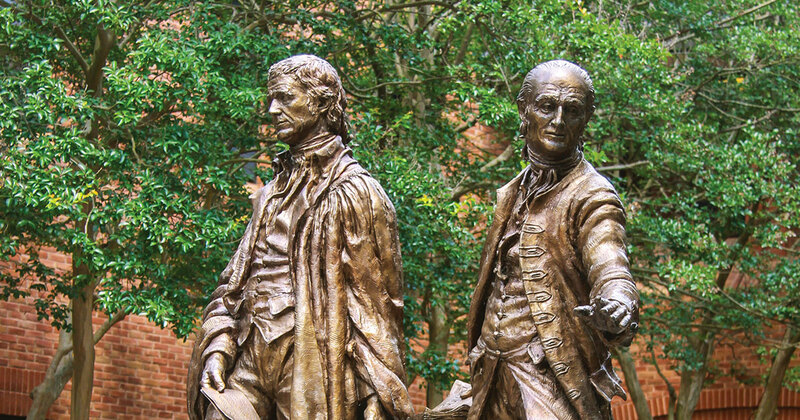 The award is named in honor of George Wythe (1726 - 1806) and is given each year by the Law School to a graduating student in recognition of selfless service. Kevin S. Elliker J.D. '14 received the I'Anson Award, the highest award given to a graduating student by the Law School faculty, during the Law School's Diploma Ceremony on May 11. The Walter L. Williams, Jr., Memorial Teaching Award is given by each graduating class to a member of the faculty in recognition of outstanding teaching. Class of 2014 Gift co-chairs Alex Mackler and Kevin Elliker announced class gift results during graduation. The W&M Law School Association awards the honor each year to a member of the graduating class who exhibits the ideals of, and commitment to, distinguished public service as exemplified by U.S. Supreme Court Justice Thurgood Marshall (1908-1993). Jacqueline Denning '76 was inducted as an honorary member of the Order of the Coif during the Law School's Awards Ceremony on May 10. This award is given each year to a member, or members, of the faculty or staff who have demonstrated character, leadership, and a spirit of selfless service to the Law School community. The text of the welcoming remarks given by LL.M. graduate Qian (Lindsey) Ling. Ninety percent of the Class of 2014 made a pledge to this year's class gift, breaking the Law School's class gift participation record. This year, the Class of 2014 boasted another milestone for women at the Law School: all five outgoing editors-in-chief of the school’s law reviews were female. Nine classes celebrated milestone reunions from five years to 45 years out and raised a total of $3,246,624 in gifts and multi-year pledges, as of the Saturday, April 12 celebration. W&M Law School's Puller Veterans Benefits Clinic shared best practices with other law schools at a "National Conference on Law Clinics Serving Veterans" in April. Class of 2009 Drapers' Scholar Genevieve Jenkins recently began a clerkship with a judge on South Africa's Constitutional Court. "Wythepedia" is an online encyclopedia created by The Wolf Law Library staff in honor of George Wythe (1726-1806). Wythe was W&M's -- and the nation's -- first law professor. Three 1L students were recently announced as winners of the 2014 Kaufman & Canoles Writing Prize. Three members of the William & Mary Law School faculty—James G. Dwyer, Michael S. Green, and Tara Leigh Grove--have received Plumeri Awards for Faculty Excellence this year. William & Mary law students recently had a chance to learn about constitutions from two of the pre-eminent jurists of our time. Michael M. Berger, a partner in the Los Angeles office of Manatt, Phelps & Phillips, will receive the 2014 Brigham-Kanner Property Rights Prize at the 11th annual conference on October 30-31 sponsored by the William & Mary Property Rights Project, the Law School announced today. Professor Jeffrey Bellin presented a proposal drawn from his recent article, "eHearsay," at a recent symposium sponsored by the Federal Advisory Committee on the Rules of Evidence. To cast your vote for nominees to the Association's Board of Directors, please submit a Nomination Proxy or attend the Annual Meeting on Friday, April 11, at 12:30 p.m. The Law School and the Williamsburg Bar Association are teaming up for the "Revive My Vote" project. William & Mary Law School to Host "Law Clinics Serving Veterans" Conference in D.C. Senator Mark Warner to give keynote address at 12:15PM on Thursday, April 3. Albie Sachs, who rose from imprisoned freedom fighter to become a justice on South Africa's highest court, recounted his career in a talk on Sunday at Hennage Auditorium, an event co-sponsored by the Program in Comparative Legal Studies and Post-Conflict Peacebuilding, the Reves Center for International Studies, and the Colonial Williamsburg Foundation. Susan Grover, a longtime professor at the Law School, has been named the university’s vice provost for academic and faculty affairs. On February 26, the U.S. Court of Appeals for the Third Circuit issued an opinion in Lawal v. McDonald in favor of the appellants, who are represented by the W&M Appellate and Supreme Court Clinic. U.S. Supreme Court Associate Justice Antonin Scalia will deliver the commencement address at William & Mary Law School’s graduation ceremony on Sunday, May 11. During the March 21 event, ELS presented two awards recognizing outstanding teaching and outstanding contributions. William & Mary Law School hosted the U.S. Court of Appeals for the Fourth Circuit on March 20. Nathan Oman, Professor of Law and Tazewell Taylor Research Professor of Law at W&M, delivered the 2013-13 Blackstone Lecture. W&M Law School’s Election Law Program hosted three distinguished practitioners of political and election law for the 2014 Election Law Symposium. Professor Jayne Barnard was the lead organizer of an amicus curiae brief filed by 44 corporate and criminal law scholars in support of the petitioners in Sebelius v. Hobby Lobby Stores, Inc. and Conestoga Wood Specialties Corp. v. Sebelius, cases pending before the Supreme Court. In a brief written by Professor Adam Gershowitz, criminal procedure scholars argue that the Court should forbid warrantless cell phone searches and instead encourage police to preserve evidence by placing phones in Faraday bags or by wrapping them in aluminum foil. Allison Davis '16 of the Election Law Society talked with nationally prominent campaign finance attorney Kenneth Gross in the video titled "Campaign Finance Primer: The Impact of McCutcheon on the States." In the 2015 survey, released today, William & Mary Law School climbed nine spots to 24th - tied with the University of Washington. This is the highest rank ever given the country's oldest law school by the magazine, which began publishing an annual ranking of law schools in 1990. The world is a classroom each summer for a growing number of W&M law students. Haider Ala Hamoudi of the University of Pittsburgh School of Law, the 2014 Kraemer Scholar-in-Residence, will present a lecture on March 13 at the Law School on "Islam in the Iraq Constitution." The event is free and open to the public. Alumni gathered on Feb. 21-22 for the first African-American Law Alumni Celebration, an event that brought together nearly 70 African-American graduates from 31 classes. The Constitutional Conversations program allows law students to indulge their interest in constitutional law and perform important work in the community at the same time. Anna Killius, a 2013 graduate of the Law School, is working as a fellow for U.S. Rep. Carol Shea-Porter of New Hampshire. Election law is a major focus of Rebecca Green's teaching, scholarship, and work as co-director of William & Mary’s Election Law Program. The Election Law Program will convene leading election law practitioners, scholars, and politicians on February 21 for a program titled "Rethinking D.C. Representation in Congress." On February 3, the U.S. Court of Appeals for the Fourth Circuit issued an opinion in Wall v. Wade in favor of the appellant, represented by the William & Mary Appellate and Supreme Court Clinic. Professor Allison Orr Larsen has been recognized as an early career Rising Star among this year's recipients of Virginia's highest honor for faculty. On Thursday, Jan. 16, Davison Douglas, the Arthur B. Hanson Professor of Law and dean of William & Mary Law School, led a discussion with members of the Law School community in early observance of Martin Luther King Jr. Day. Molly Ward, a 1987 graduate of William & Mary Law School, has been named secretary of natural resources by Virginia Governor Terry McAuliffe. After several years designing fighter jets, Scott Lindvall '86 set a new career course in law. He credits his W&M legal education for launching his success. Professor Adam Gershowitz uses "The Wire" to provide a window for students into a world in which the law is not always so neatly applied.